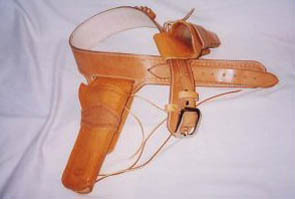 Our leather holsters and gunbelts are made from 10/11oz. 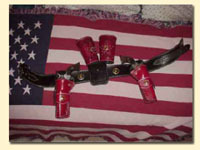 U.S. skirting. 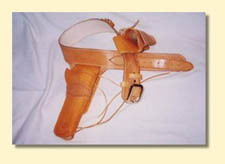 Holsters are molded to your gun - any single-action revolver. 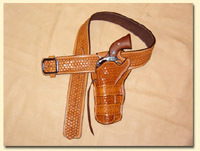 Holsters start at $80. 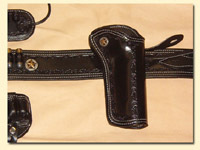 Single Holster & Gunbelt combo start at $170. 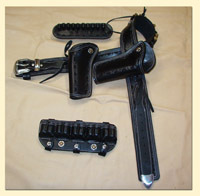 Double Holster & Gunbelt rigs start at $300. 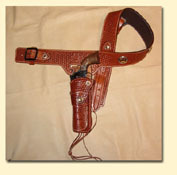 All holsters and gunbelts are fully lined. 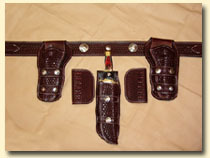 Stamped designs are put on all holsters and gunbelts at no charge. 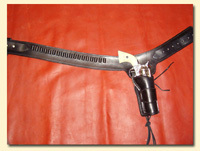 18 bullet loops are included on every gunbelt and additional loops are $1.00 each. 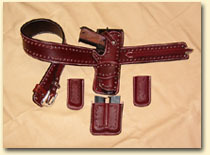 The choices in color are Saddle Tan, Brown, Black, Chestnut, Russet, Mahogany and Chocolate. 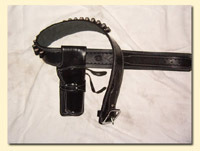 Click on picture to see a larger image. ©2004-2007 Leather, Guns & Etc. All Rights Reserved.